When you appeal to the First-tier Tribunal (FTT) SEND Tribunal about an issue surrounding a child or young person's Education, Health and Social Care plan (EHCP), problems with the health and social care aspects cannot be dealt with. They have to go through separate complaints processes, something that is not only illogical but causes a great deal of additional stress for families. 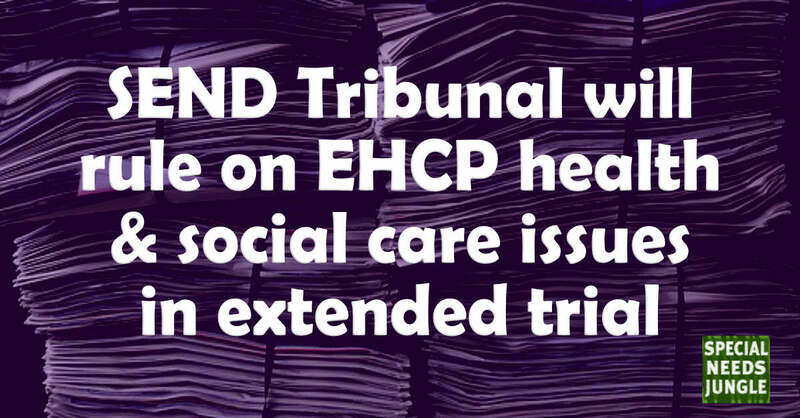 To start to explore a single route of redress for EHCP appeals, the SEND Tribunal last year ran a very limited trial involving just 17 of the 152 local authorities. It enabled judges to hear appeals about health and social care and make non-binding recommendations for the latter two as well as its directions for education issues. However, you must have an education issue to appeal as well as health and/or social care, you cannot appeal for just the latter two. The trial had an overwhelmingly positive response and was evaluated in the comprehensive CEDAR report published in March 2017. However, perhaps unsurprisingly, it was decided that because the trial was so small, insufficient evidence had been gathered to decide whether to make it a national, permanent feature of the SEND Tribunal. Robert Goodwill MP Minister of State for Children and Families has now announced that the trial will be extended to the whole of the England. The trial will begin in March 2018 and will run for two years. Order that an EHC plan should be issued, and could make a recommendation that, when drawing up a plan, health and/or social care needs of a particular kind, which relate to the child or young person’s SEN could be specified. Where a health and/or social care need, or provision was not included in an EHC plan, the FTT could recommend that it should be specified in the plan, and where it was already included, the FTT could recommend that the need or provision should be amended. It's our assumption that these powers will be the same under the extended trial. The CEDAR review (the trial information is in Chapter 7, from page 183) identified that the pilot encouraged more joint working across the three areas and most parents, LA representatives, mediators and parent organisation representatives were in favour of a single point of redress for the all the of the content of an EHC plan. Pretty much everyone who took part in the trial from parents to LAs and local health bodies (Clinical Commissioning Groups or CCGs) recognised the logic of including health and social care in the process. that it stimulated more joined up working across education, health and social care, increased knowledge of each sector’s relevant legal frameworks and practices, and acted as a ‘lever’’ to promote reaching a resolution prior to the Tribunal hearing. It also prompted improved joint working practices between education social care and health, for example, over the quality and timeliness of reports for EHC needs assessments and over joint funding of post-16 provision with adult social care and/or adult health services. What's the point if they're non-binding? So if health and social care providers cannot be legally compelled to do what they are supposed to do, why would they bother? However, the trial found that in almost every case the recommendations were implemented. In the case where it wasn't, the health body concerned objected to the fact that the report the decision had been based on was a private one and not an NHS one. While the First-tier Tribunal's recommendations are non-binding for health and social care partners, we would generally expect that recommendations are followed. If recommendations are not followed, families would be able to complain to an Ombudsman or in exceptional circumstances, seek to have the decision judicially reviewed. The Children and Families Minister, Robert Goodwill said the extension will "reinforce the person-centred nature of the Children and Families Act 2014 by enabling the Tribunal to take a more holistic view of the child or young person’s needs." From March 2018 the FTT will be able to make ‘non-binding recommendations on the health and social care aspects of Education, Health and Care (EHC) plans. The regulations will set out the new duties on all local authorities and health commissioners. Local authorities will be able to receive support from a company, specially appointed to provide back up. Senior health and social care commissioners will be invited to attend training in January and February. We are aware of the concerns about the lack of involvement of social care in the EHC Needs Assessment process or worse, when scare tactics are used against parents. It is about time that a single point of redress can be used by parents, especially as the entire reforms were intended to make life easier for families and should have been included at the start - as was highlighted then. We do think however, that recommendations should be legally binding as this in itself will take the stress out of an incredibly stressful event. We will be looking out for the developments on the trial and it will be interesting to see how it works it practice. See, it's not that difficult if you try to obey the law really, is it? What are your views? Add them in the comments below. ‘Non-binding’ in other words completely pointless. I honestly feel there is a level of what is the point of the health and care sections sometimes as the education section is hard enough to do and the health and care is even more smoke and mirrors. It’s ridiculous that it wasn’t already inclusive of health and social care. The clue is in the name of the document. The issue of private reports and diagnoses really needs to be addressed as a matter of urgency. I cannot imagine any private professional would recommend unachievable or frivolous therapies, supports or provision and they certainly wouldn’t diagnose a condition that someone didn’t have. So it’s another excuse being used where they cite private reports as a reason. This will really cause difficulties in the case of pathological demand avoidance (PDA) because there are many authorities that refuse to recognise this ASD subtype and they use the ADOS-2 which isn’t the most accurate tool for this condition and an NHS assessment often leaves children without a diagnosis, meaning parents have no choice but to go private. As we all know, even though EHCPs are supposed to be needs-based and not diagnosis based, the reality is that without a diagnosis LAs will battle parents relentlessly. Apparently we are all making it up. If they’re non-binding it’s pointless offering judicial review as an opportunity of redress because a judge would throw it out. Regarding social care, I don’t think this will have any effect on the wrongful targeting of SEN parents with false accusations, in fact it is since the joined up working approach has been in place that these scenarios have increased. Professionals working outside their field of knowledge and expertise have the potential to do a lot of harm and they all trust one another implicitly. It’s become a gossip-fest. If a family has been targeted for child protection, having social care support in the EHCP won’t stop social care saying there are CP issues. The problem goes much deeper. No autism training for social workers, a tick-box mentality meaning they cannot understand how autism families function etc. And without a diagnosis parents are even more likely to be targeted with ridiculous accusations of MSBP/FII. This isn’t a single route of redress for parents to appeal, parents will still have to use the separate complaints process. If a parent is appealing the education aspects of an EHCP then they will be able to include the health and care elements of the EHCP when going to FTT, but if the education aspects are ok they can’t go to FTT for the health and care aspects and must instead use the separate complaints process. Hope parents don’t seek ed disputes where there might not have been one – to have H/C issues heard.